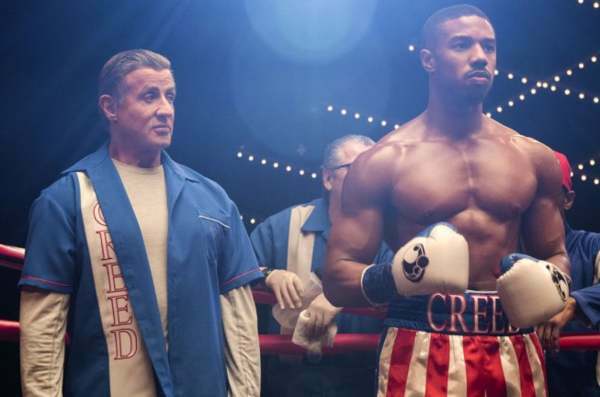 There’s a moment in Creed II when Rocky Balboa (Sylvester Stallone) tells young Adonis Creed (Michael B. Jordan) “It’s your time”, a piece of advice which feels rather ironic, particularly when this follow-up to Ryan Coogler’s critical and box-office smash should be titled Rocky VII rather than Creed II. Quickly giving us an indication of what’s to come, the film begins in the Ukraine, where former boxer Ivan Drago (Dolph Lundgren) now resides with his son Viktor (Florian Munteanu). Exiled by his country after losing to Balboa over thirty years ago, and living in relative squalor (you keep waiting for Mickey Rourke’s character from Iron Man 2 to make a cameo), Drago has ruthlessly moulded Viktor into an equally dangerous competitor, with his endgame soon becoming obvious. Back in the U.S., Adonis has successfully won the heavyweight crown, and is ready to take his relationship with Bianca (Tessa Thompson) to the next level. When opportunistic promoter Buddy Marcelle (Russell Hornsby) brings the idea of a new Drago vs Creed face-off to Adonis, the seed of revenge is effectively planted, but it is something that Rocky doesn’t want to be a part of, as the guilt from what happened all those years ago still haunts him. Also unhappy about Adonis’ decision to fight is his mother Mary Anne (Phylicia Rashad), who like Rocky, doesn’t want to face the same kind of tragedy for a second time. As the fight nears, everyone’s thoughts and agendas are placed on the table, and relationships will be tested. After Stallone brought respectability back to the Rocky series with Rocky Balboa (2006), one felt that the franchise had achieved suitable closure, as there seemed no way it could carry on in a credible manner. But in 2015, co-writer/director Ryan Coogler destroyed those preconceptions with Creed, reinvigorating the Rocky universe by introducing audiences to Adonis Creed, a strong character with his own path to forge, while cleverly paying tribute to Stallone’s legendary creation. Coogler, who was clearly a fan of the previous movies, brought genuine affection, conviction, and respect to the material, not only developing a terrific, stand-alone role for his Fruitvale Station star, but also a beautifully layered one for Stallone, who ended up giving one of his best performances. The added bonus was Bianca, played with absolute assurance by Tessa Thompson, a gifted actor whose career has certainly taken off in the ensuing three years (Thor: Ragnarok, Sorry To Bother You, Annihilation, Westworld TV series). With box-office success comes the inevitable sequel, and everyone is back apart from one notable exception (Coogler is only on board as a co-executive producer), but it is this central omission that proves to be this slickly produced follow-up’s major weakness. There was such fire and purpose to Coogler’s vision, and Stallone was smart and observant enough to allow a talented young film-maker put his distinctive stamp on the production, allowing two generations to click together wonderfully. But now with the possibility of a new long-running, financially viable franchise in the making, Stallone takes a more active role behind the scenes, and his script, co-penned with debutant scribe Duel Taylor, places his iconic character more front-and-centre this time, while borrowing liberally from previous Balboa entries, and it’s this change in focus that has the film coming across more like a continuation of Rocky than a proper expansion of Adonis’ world. Adonis and Bianca’s romance echoes Rocky II a little too much, the boxing arc is lifted from Rocky III, while of course the main thrust of the story largely relies on multiple characters and incidents from Rocky IV. Along with these primary examples, there are other references that are dotted throughout, and too often Rocky’s problems, old and new, push the title character’s issues to the side, sometimes to jarring effect. Jordan, who made a strong impression in Coogler’s first-rate Black Panther, is good as Adonis, but the lopsided nature of the screenplay doesn’t allow him to truly shine. The same can be said for Thompson, who moderately succeeds in rising above her underwritten role. Stallone is an agreeable screen presence, but is hampered by the heavy-handed dialogue he has given himself. Real-life boxer Munteanu looks imposing as Viktor, but can’t overcome his thinly constructed character. Walking away with the film is Lundgren, who skilfully presents a man who was once idolised by millions, desperately wanting to regain that glory by any means necessary. The entire subplot involving Drago, his fall from grace, and the relationship between he and his son could have been a movie in itself, and one almost feels like there was a lost opportunity there. Director Steven Caple Jr., whose only other film of note is the low-budget skateboard drama The Land (2016), smothers Creed II with a confident sheen, but cannot put a unique spin on proceedings this time around, as he is dealing with reheated, all-too-familiar story beats. Even the boxing scenes, while competent, lack the excitement and ingenuity of its predecessor, especially when Coogler gave us that exceptional one-take sequence (although it did remind one of the boxing scene from Seung-wan Ryoo’s excellent Crying Fist (2005), which was also done in one take). When the Rocky theme starts up during the final bout, you are truly aware about where the attention in Creed II lies (it is odd that by the end of a sequel, the title character still doesn’t have his own theme), with a screen icon we have known for decades taking growingly awkward precedence over the one so powerfully introduced three years ago. 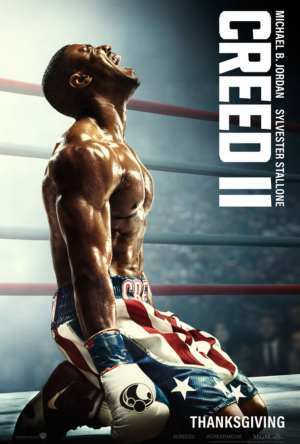 With a noticeably calculated formula running through its veins, Creed II feels like a return to business-as-usual, and one can only hope that Coogler can helm sequel number two, subverting audience expectations the same way he did in 2015.